All proceeds go toward the Juneau Police Department K-9 Unit! This past summer, Juneau Crime Line / Crime Stoppers held a fun Whale Watch Fundraiser, thanks to the generous donation of the cruise from Allen Marine Tours. The Crime Line Board dedicated that event to the memory of Kathy Hildre, a zealous and dedicated Board Member, who had a passion for the well-being of Juneau’s youth. Crime Line also pledged that, in Kathy’s honor, a portion of those proceeds would be donated to a program that benefited both Juneau’s youth and supported the community outreach efforts of the Juneau Police Department. The program chosen was the JPD sponsored DARE program that two JPD officers (Officers Blain Hatch and John Cryderman) organize. Officer Hatch is an ardent supporter of the DARE program, not only for the program’s life lessons, but also because he feels it lets kids get to know police officers in a friendly environment. He shared that the friendship and trust built from the program remains for years and that kids he met through the program years ago still communicate with him. The DARE program costs approximately $4,000 a year to operate, and Crime Line presented a check for $1,000 to Officer Hatch. Kathy’s son, Jimmy Hildre, was on hand for the check presentation in December and reiterated his Mom’s passion for Crime Line and that Crime Line’s support for the DARE youth program was a fitting tribute to her. Juneau Crime Line / Crime Stoppers is a local non-profit group comprised of local all-volunteer citizens and is entirely funded by local contributions. More information about the Reward Programs supported by Juneau Crime Line / Crime Stoppers can be found at JuneauCrimeLine.com. You can also follow us on FaceBook at Juneau Crimeline. 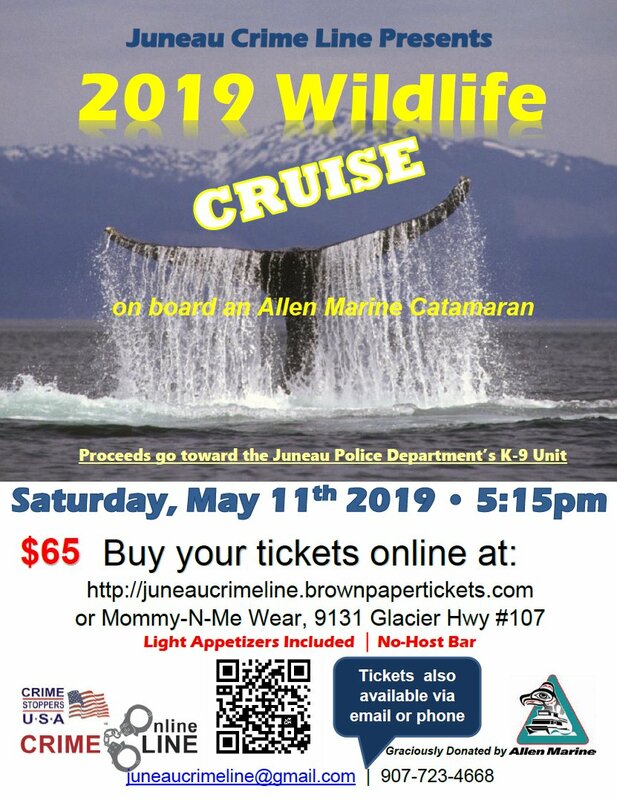 Thanks to Allen Marine Tours, Inc., Juneau Crime Line will again be hosting a Whale Watching Fundraising Cruise on May 18, 2018. From Left to Right: Board Members Bob Kanan, Robin Paul, Eric Hansen, Kathy Hildre’s son Jimmy Hildre, Officer Blain Hatch, Board Members Jessica Paul, Mindy Rowland, and Shawn Hooton. Juneau businesses and individuals that have been victims of a crime and wish to offer a reward specifically aimed at catching the perpetrators can obtain extra help from Juneau Crime Line – Crime Stoppers. We can partner with other reward offers by enhancing the reward through Juneau Crime Line as well. Crime Line may be able to add up to $1,000, in addition to other rewards. Businesses and individuals offering rewards will benefit in other ways as well. Crime Line can apply its reward criteria policy and methods for paying rewards. There are additional benefits from our organization’s media and web publicity, too. Juneau Crime Line has a proven track record since 1981. Many tips received have resulted in arrests and recovery of substantial amounts of property and the payment of rewards for information for helping solve crimes. In addition, Juneau Crime Line through its overwhelming public response has been accepted by the Juneau Police Department as another effective tool to bring criminals to justice. Additional information about offering rewards is available at PO Box 20141, Juneau, AK 99802. Juneau Crime Line is an all-volunteer group, so 100% of the donations go directly to support our anti-crime endeavors. Your donation of any size will make you a part of this successful community program working on your behalf. Solving crimes and removing drunk drivers from the roads increases the safety of innocent bystanders thanks to donations from businesses and individuals like you who support Juneau Crime Line. It's all about making Juneau a safer place for everyone. Juneau Crime Line is a qualified 501c3 non-profit corporation. Juneau Crime Line would like to remind you that tips provided through the Crime Line website can remain anonymous. 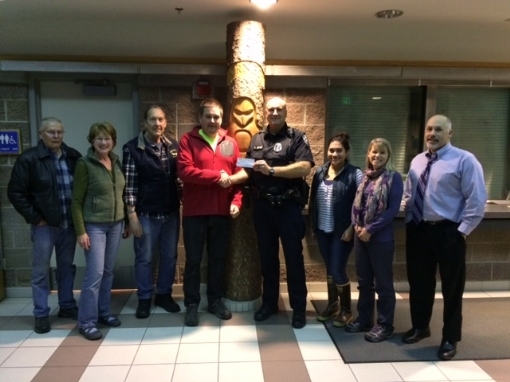 Juneau Crime Line is solely funded by donations from the community. Juneau Crime Line encourages members of the community to assist local law enforcement agencies in the fight against crime by overcoming the two key elements that inhibit community involvement: fear and apathy. Juneau Crime Line provides Web Tips to encourage citizens in the community to volunteer vital information helpful to law enforcement agencies to fight against crime. Tipster can remain anonymous and are eligible to receive a cash reward if the information given leads to an arrest or grand jury indictment of a felony offender. Juneau Crime Line relies on a volunteer board and tax deductible contributions from the public in order to operate the administration of the programs.